Oil fuel, often stored in underground tanks, was once a popular source of heat in homes across the United States. Unfortunately, these steel containers are prone to developing rust damage and have a finite lifespan of about 20 years, posing an increasing risk of leaking and soil contamination over time. Getting a professional inspection of your storage system is crucial to protecting your health, the environment and the resale value of your home. If an inspection finds evidence of damage or leaking, it is imperative that you schedule oil tank removal as soon as possible. Even an empty, decommissioned tank can pose a contamination risk. A licensed environmental professional will be able to perform soil tests around the tank to determine the risk of pollution. In addition to being an immediate health hazard to those living in the home, leaking oil can contaminate groundwater and lead to costly lawsuits and cleanup costs. If your tank is more than 15 years old, the likelihood of imminent structural failure is high and oil tank removal may be your best option. In addition to being less efficient than modern HVAC systems that use electricity or natural gas, oil heating systems, especially aging ones, can have a significant negative impact on your home’s resale value. 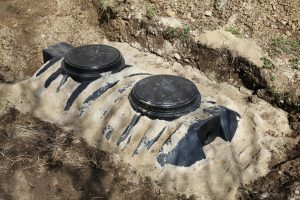 Even if they are willing to take on the inherent risks posed by an underground oil tank, prospective buyers will expect to see full documentation proving that oil has not contaminated the property. Additionally, many banks will refuse to offer a mortgage on a property with an underground tank. The process of removing a buried tank should always be handled by professional technicians. In addition to extracting the structure without causing further leakage, an experienced contractor will be able to perform soil remediation to ensure that all risk of contamination has been removed.